Does the Internet cause revolutions? Frequently that is being suggested, whether in the discourse surrounding the Arab Spring, Stuttgart 21, or the Occupy movement. The Internet, conventional wisdom assumes, is a global village that enables seamless and open communication. Social media such as Facebook and Twitter allow to rapidly exchange information and disseminate views, something that was arguably more difficult to accomplish in the past. But critics such as Malcolm Gladwell and Evgeny Morozov call this into question – clicktivism alone doesn’t make a revolution, they counter. How does political activism in hashtags work? In a conference paper my colleagues Marco Bastos, Rodrigo Travitzki and I recently explored this question. We analyzed 455 hashtags on different topics and in different languages (mostly English, Spanish and Portuguese tweets) , with a total of over 1 million different contributing users. One of our findings is that there are forms of serial activism: in many cases the same users tweet on a variety of issues. In itself this is not surprising, but the intensity is significant – roughly 70% of all users in our dataset tweeted under at least two different hashtags. Political hashtags are especially popular among users tweeting about multiple causes (for example Occupy and the Spanish Indignados movement). This engagement does not automatically translate into political activism outside of Twitter, of course. But users inside our sample who tweeted under political hashtags often did so for multiple causes. Another interesting finding is the addressing and mentioning of well-known users and institutions under activism-related hashtags. Users such as @barackobama, @occupywallst or @cnn appear in a large number of tweets of other users without contributing themselves. It is difficult to tell why exactly this happens. Tweets referring to news items are often commented on and redistributed under activist hashtags, but this alone does not explain the phenomenon. It seems likely that activists want to recruit prominent users for their cause (or at least catch their attention). For example, passive users total almost 20 million followers – five times as many as the actively tweeting users in out data. On the other hand, even without tweeting, such sock puppets can generate attention, for example when users actively search for tweets related to (i.e. mentioning) Barack Obama, without clarifying that he does not necessarily endorse the cause he is associated with through the tweet. Unsurprisingly language plays an important role when examining how closely individual hashtags relate to one another (measured by the users they share). The figure below shows the hashtags colored according to the language that is dominant in them (blue for English, red for Portuguese, green for Spanish). 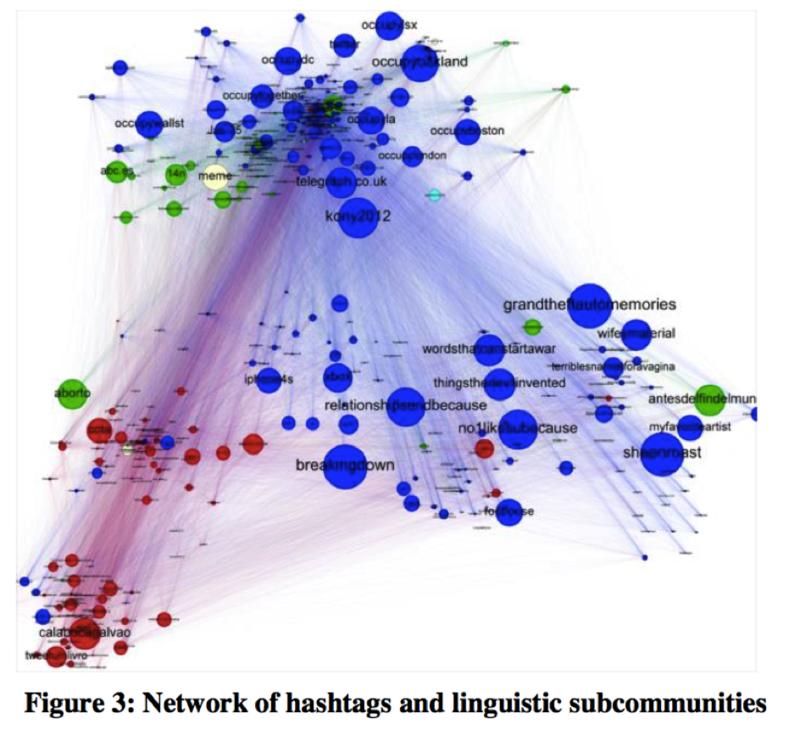 The closest association is between hashtags that share the same language, although Spanish and English hashtags are somewhat closer associated than those in English and Portuguese. Thematic groups are also clearly visible: the Occupy movement, Kony2012 and the Spanish Indignados (15M) movement are both connected internally and to each other. This transcends language barriers, a pointer to their character as transnationally followed events. The results of our study suggest that political movements such as Occupy and 15M are driven on Twitter by highly active and politically engaged users who communicate about a range of issues and transcend language barriers. – Bastos, M., Puschmann, C., Travitzki, R. (2013). Tweeting Across Hashtags: Overlapping Users and the Importance of Language, Topics, and Politics. Proceedings of 24th ACM Conference on Hypertext and Social Media, 1–3 May 2013, Paris. 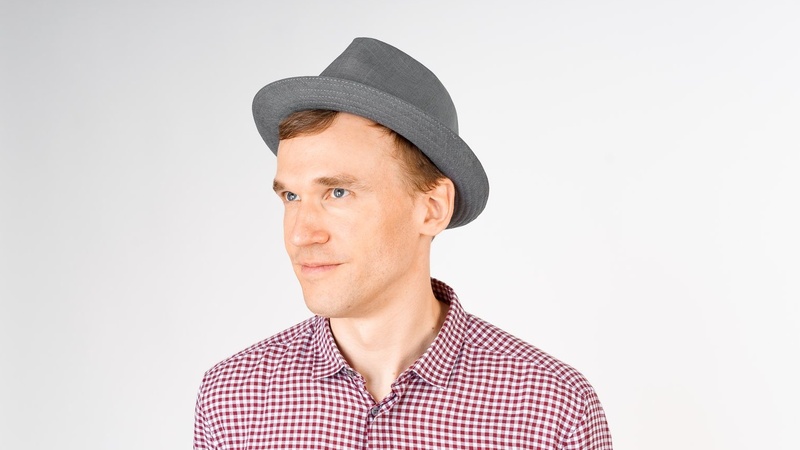 Cornelius Puschmann is an associate researcher at HIIG.